Are you the owner of Chicken Gold Campground and R.V. Park in Chicken Alaska? Did you know that you can convert this page to a complete listing of your services today for nearly nothing? Put your listing in front of visitors planning their trip to Alaska. Add your own coupons, pictures, services and more. Full advertiser packages available. Contact us today, we're your neighbors and friends so don't be shy. Chicken Gold Camp and Outpost is located 66 miles north of the Alaska Highway via the Taylor Highway or 108 miles from Dawson City, Yukon via Top of the World Highway that leaves the Alaska Highway just north of Whitehorse Yukon. Description - This Alaska Campground is on the Taylor Highway in the uniquely Alaskan town of Chicken, Alaska. 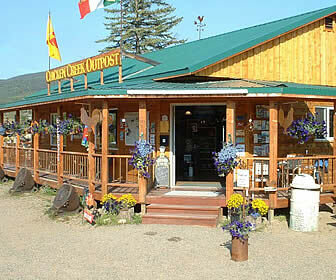 Chicken "Gold Camp & Outpost" is a restful destination rich with mining history and filled with folklore. Renowned as being a premier vacation resort that happens to have an RV Park, Chicken Gold Campground also has cozy cabins, a cafe and gift store where prospective gold panners can stock up on their Alaskan gold panning supplies to partake in a little recreational gold panning while visiting this historic location deep in the heart of Alaska. Don't pass up on a chance to see the historic old gold mining dredge while visiting this part of Alaska's colorful history. Directions - located in the center of Chicken on the Chicken Loop Rd. Turn on Airport Road at mile 66.4 Taylor Hwy and take the 1st or 2nd left. Take a moment to spread the word about the newest campground directory in Alaska. West Fork Campground located at Mile Post 49 on the Taylor Highway has 7 pull-through sites and 18 back-in ones as well. While there are no hookups available nor dump station there are those infamous campground outhouses. Walker Fork Campground located at Mile Post 82 on the Taylor Highway has 18 sites and more of those grand outhouses that campers have come to love. Eagle Campground located at Mile Post 160 on the Taylor Highway has 18 sites and several more of those comfy outhouses that we just never seem to forget. We hope you have the time to experience camping along the Taylor Highway in Alaska. Information for camping along the Taylor Highway in Alaska.